The Rev. Christopher Potter , St. Johns Episcopal Church, RSM, Calif.
Fr. Christopher was appointed vicar of St. John’s Church and School in May 2017. St. John’s Church has nearly 300 members; St. John’s School has about 450 students, ranging from infants to kids in eighth grade. Fr. Christopher’s path to St. John’s is fascinating! Born into the Roman Catholic tradition, Christopher felt God’s call to ministry around the age of 13. He received a B.A. in Philosophy, with a music minor, from The University of San Diego, and an M.Div in Ministry, from St. John’s University, Collegeville Minnesota. He was ordained a Catholic priest in 1982, and served in several pastoral assignments in Riverside and San Bernardino Counties. He took leave from parochial ministry, married, raised a family, and built a few businesses along the way. At St. John’s, Fr. Christopher sees his priestly role as fostering and nurturing hope. “My passion and education merge at the intersections of liturgy, education, personal response to the Gospel of Jesus, and encouraging people to join in the work of fulfilling God’s reign on earth. A priest is called to be the mid-wife of hope. Fr. Christopher previously served as Assisting Priest at St. Stephen’s and St. Joseph in Buena Park, and most recently as Priest-in-Charge at Church of the Blessed Sacrament in Placentia from 2013 to April 2017. In the Episcopal Church, Christopher served on two diocesan committees: the Bishop’s Liturgy Committee, and the Diocesan Committee on Disabilities. He also holds licenses/certifications in California as a Group Home Administrator, Adult Residential Facility Administrator, and is a Certified Instructor in Non-Violent Crisis Intervention and Prevention. In his free time Fr. Christopher enjoys spending time with his daughter, cooking, and riding his bicycle 15 miles a day. Rev. Karen was baptized a Presbyterian, confirmed in the Lutheran Church, and finally arrived at the Episcopal Church in 1982, and was received into TEC shortly after. Before going to Seminary, Karen taught Sunday School, worked in various leadership positions which included Vestry (twice), worship leadership, Cursillo ministry, Bible Studies in two Episcopal Churches — St. Clement’s in San Clemente and Emmanuel, Fullerton. In addition, after their children were mostly grown, Karen worked for Capistrano Unified School District in the Adult Transition program, followed by employment by Casa de Amma in San Juan Capistrano. Karen was ordained with her husband, Dave, in 2007. They served at three Episcopal churches in the Inland Empire: St. Peter’s, Rialto; St. Luke’s, Fontana; and St. Clare’s, Rancho Cucamonga. In February 2014 Karen was called to St. Wilfrid of York Episcopal Church in Huntington Beach. Karen’s beloved husband, Rev. Dave, went on permanent disability due to an Alzheimer’s diagnosis. He passed away January 6, 2016. At St. Wilfrid’s, Karen’s areas of responsibility were Pastoral Care and Outreach, with a particular focus as Executive Director of Beach Cities Interfaith Services, a 501c3 organization whose mission is to offer compassionate, faith-based service to all in need. As St. John’s Associate Vicar, Karen believes her role is to partner with Rev. Christopher, the people of St. John’s, and the church staff to present the Gospel with love, humor and compassion in every encounter, including the greater Rancho Santa Margarita community. Karen and Dave have two children, Gretchen, and Michael. Gretchen Killebrew and her husband Mark have three children Kye, Kalena and Ella. Michael Maurer and his wife Haley have two children, Vivienne and Jackson. Karen is close to her family members, including her sister JoAnne Sand and her husband Brad; Dave’s brothers Stephen Maurer and his wife Jane, and Larry and his wife Barbara. Many nieces, nephews, grandnieces and grand nephews round out Karen’s extended family. Karen’s hobbies include daily walks, beach doubles volleyball, reading, swimming, playing music with friends, spending time with family and friends, and entertaining at home. Patti joined the staff of St. John’s January 1, 1998. Baptized in the Armenian Apostolic Church, she attended a Lutheran Sunday School as a child. In high school she attended Young Life, but mostly to hang out with friends. Then she attended a Saturday night concert at Calvary Chapel in Costa Mesa led by Pastor Chuck Smith and was forever hooked on Jesus. However, as most young adults do, Patti wandered away from the church while she worked, pursued a career in business and simply had fun. And then one night, during a tough time in her professional life, Patti ended up at the 2nd Harvest Crusade at the Pacific Amphitheater. And there on the stage was her old pastor, Chuck Smith, talking about only God knows what (seriously… she doesn’t remember a word of it) and was back. She started attending Calvary again. But still something was missing. A friend wanted to church shop and Patti went along; they saw an ad in the yellow pages (the OG Google) for a little Episcopal church down on Lido in Newport. Patti and the friend went and that was that. The Episcopal Church had exactly what was missing — liturgy. It was the Armenian church but in English! Within a short period of time, Patti was volunteering in Sunday School and even led Vacation Bible School when the director had to back out at the last minute. Even though she had no experience with VBS except as a child attendee! Patti was hooked. Children and Youth Ministry was where God wanted her. Within months, she had closed her business, gotten a job, and eventually went back to college part time, receiving her degree in Religion/Ministry and Leadership from Vanguard University (then Southern California College). Her priest at St. James heard about a job opening for Chaplain at St. John’s and sent Patti out for an interview for what was supposed to be interview practice. There were five priests also applying for the job, but Patti was chosen for the position. Patti has worked with several St. John’s parishioners in youth ministry and is so very grateful for them all. On the school side, Patti teaches grades K, 1, 2, 3, 4 and 8, plus manages the chapel schedule, leads the Preschool chapels and is pretty much all over the campus. She wouldn’t trade this job for anything. Patti met her husband Scott when he came to the school to present at a teacher workshop and they were married in July 1999. They live in Huntington Beach where they ride bikes every weekend. Patti also spends quite a bit of time with her grandniece at Disneyland — because what better place to babysit? Roger joined St. John’s parish in 2010, taking on volunteer roles in the Food Pantry and Men’s ministry before becoming its Assistant Church Administrator in early 2017. Roger was raised in a non-religious household, never really thinking about the subject until as a newlywed, his wife, Joanne, said that she wanted to find a church home for the two of them. They were baptized together in to the Roman Catholic Church when Roger was 25. They chose the Roman Catholic faith because they were drawn to its traditional liturgy and pageantry. 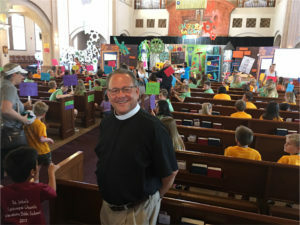 Being on the School Board of St. George’s Episcopal School in Lake Forest, where his two son’s attended, led Roger to experience his first Episcopal church service in 2002. He and Joanne were already experiencing frustration with the direction of the Roman Catholic Church, so Roger suggested to Joanne that she check out a service at St. George’s too, and they both knew that they had found a new church home with the Episcopal Church. They stayed at St. George’s until a job opportunity took them to France and Denmark for five years. Based on the strength of St. John’s Youth Ministries, they joined St. John’s when they returned in 2010. Wanting to deepen his knowledge of the Bible, Church history and its place in society, Roger enrolled in the Education for Ministry (EfM) program at St. John’s in 2013, and graduated in 2016. He found the program very rewarding, as it increased his knowledge and understanding of God’s love for all of us, and how to apply that love to his everyday life. Roger’s hobbies include woodworking and home improvements, working on his old car, and walking his two high-energy dogs with his wife.